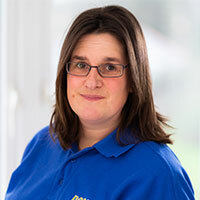 Louise comes from a farming background and qualified as a veterinary nurse in 1998. She has worked as a student nurse in Plymouth and at a Newquay practice. She joined us at Penmellyn in 1999. Louise is one of our nurses who works within the equine department. She particulary enjoys working in the equine theatre and assisting with cattle caesarians and surgical procedures. Outside of work she has three children to keep her busy while also enjoying riding (pleasure and endurance rides). She is currently teaching her daughter to ride on her Welsh section A pony. She enjoys walking her Labradors and has had a litter of puppies from one of them. Louise also helps out on the family farm when needed including the milking.